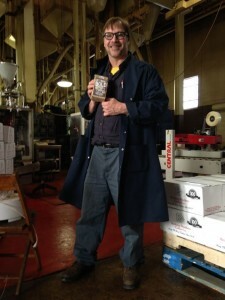 Roaster hopes coffee can perk up Detroit - Detroit Bold Coffee Co.
Officially, the Million Bag March starts today. But the first $10 is already in the till, and Bag No. 1 is sitting on my desk. Logic tells you that AJ O’Neil cannot sell 1 million 8-ounce bags of his Special Blend Detroit Bold coffee in 12 months. He cannot amass $5 million, or $5 from each $10 sale, to help block clubs from bleak neighborhoods open Detroit Bold Community Cafes. The same logic, though, said he couldn’t pull off a 50-hour “Danny Boy” marathon to commemorate St. Patrick’s Day in 2008. AJ’s Music Cafe in Ferndale couldn’t possibly set the world record for continuous live music three times, finally topping out at exactly 15 days in 2011. A little independent coffee roaster like Detroit Bold couldn’t wedge itself onto the shelves at Kroger and Meijer. Except that all of it happened. Now O’Neil, 52, will try to resurrect the city, one brown paper bag at a time. Other people are trying, too. Dan Gilbert is a one-man gross national product downtown. Midtown is jumping. The heavy hitters are hitting heavily, and bless them for it. But the dots aren’t connecting yet to Brightmoor or Chalmers/I-94 or Highland Park. Those are among the places where you will find O’Neil’s heart, and where he hopes to put locally run, locally owned, locally loved cafes. A few years into its existence, his line of Detroit Bold coffees is percolating nicely. O’Neil is outlining his campaign at a conference table at Becharas Brothers Coffee Co., roasters and suppliers of coffee in Highland Park for 101 years and counting. Much as Detroit envelops Highland Park, Becharas Brothers envelops Detroit Bold, blending and bagging its products. It turned out he was somewhere in the Cass Corridor — a part nobody has elevated to “Midtown” yet — distributing food. So Becharas is on board with the Million Bag March, a concept both simple and complex. The simple part is buying the signed, numbered bags of Special Blend, a medium-dark Arabica. Go to the Mootown Creamery on Russell Street in Eastern Market; go to DetroitBoldCoffee.com; or flag down the Boldmobile, a 2013 Ford Transit outfitted as a rolling billboard and warehouse. The Boldmobile replaced a white 1995 Ford Explorer with a broken heater and 250,000 miles on the odometer that Becharas sales director Sam Iaquinta called “the Exploder,” even though it never did. Clearly, O’Neil has not grown as rich as his Colombian espresso. But he’s sharing what he has, primarily vision and optimism. The plan is to stash $5 from each bag in trust, then use the money to collaborate with neighborhood associations to rehab and furnish a crumbling building, train a staff, and open a place where locals can learn, earn, and oh, yes, drink good coffee together. If the object were to make money, it would never happen. The first $5 million will pay for maybe five shops. The object instead is to help the neighborhood association prove itself for a year, then turn over the deed. Ultimately, O’Neil pictures Detroit Bold Community Cafes in struggling areas across the United States. He’s also planning another music marathon for March 2016, a celebration that will sweep across Eastern Market and reclaim the record from a group in Las Vegas. But the very long first step is the Million Bag March. Then Iaquinta reaches for his wallet. Make that 999,998.